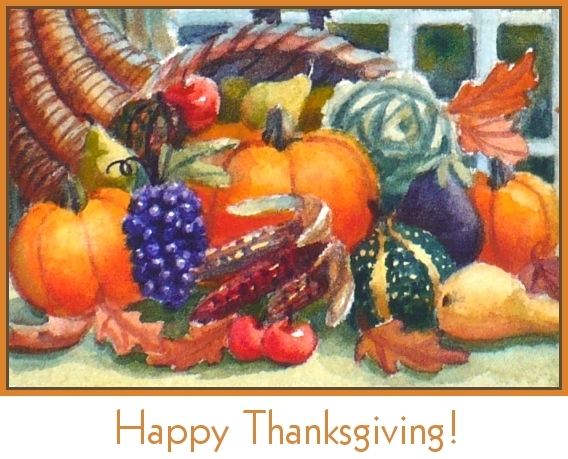 Zeh Original Art Blog Watercolor and Oil Paintings: Happy Thanksgiving! Thanksgiving Day is celebrated here in the U.S. on the last Thursday of November to remember, like the early Pilgrims who came to these shores, how thankful we are for the good things in our lives. Though the early settler's lives were incredibly difficult, they had an abundant harvest the year of the first Thanksgiving feast. They knew how to count their blessings! There are so many things to be grateful for - family, friends, sunshine and clean air to breathe. I am thankful for the gift of art, for all the wonderful people who appreciate art in any form and for the artists who create it. Thank you! Wishing you and yours many blessings and the brightest of days!